It's true that long-term success for local business is tied to warm relationships within the community. One great way to stir up goodwill is to invest where your customers live. If you would like to become part of the Circle View family as a community investor, we would love to tell you more! Benefits to you are listed below, along with sponsorship levels. All donations are tax-deductible (as allowed by the law). You can donate by credit card using the online form. If you complete a paper form, mail or deliver it (along with your check) to Circle View. The Circle View PTO is a 501 (c) 3 non-profit. Tax id# 20-4834669. Are you a parent or family member of a Circle View student and interested in sponsorship opportunities and additional benefits? Then, click here to see and reserve special Circle View Family Sponsorship opportunities. The forms below are for non-Circle View Families interested in Corporate Sponsorship. Forms below are for Circle View Families interested in Corporate Sponsorship. Our Casino Night is one of the most anticipated events of the school year!! You and/or your organization have an opportunity to do good in your local community, make a direct impact on kids’ lives, and invest in our future. 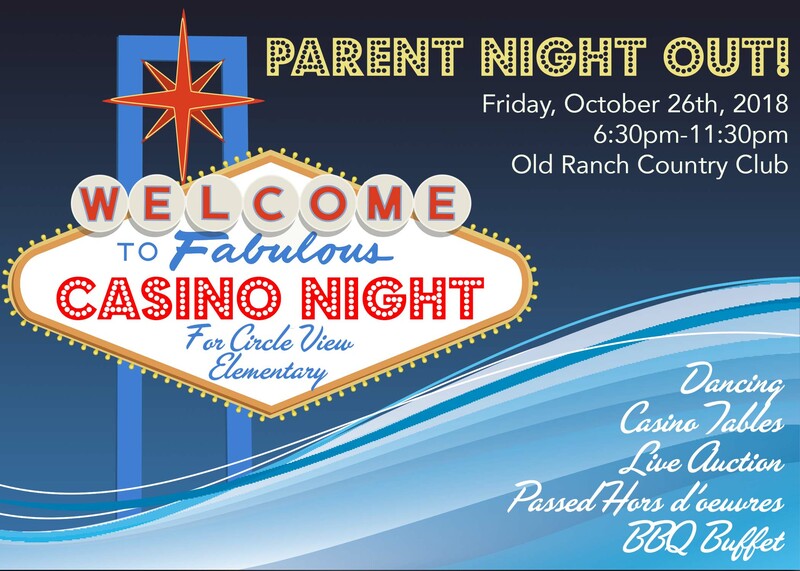 Support Circle View's Parent Teacher Organization (PTO), as it hosts its Parent Night Out and live auction fundraiser event on October 26, 2018. More than 200 parents and staff members attend this event and many more will view our sponsors on social media and on our Circle View PTO website, the information hub for our parents. Your generous tax-deductible donation will help strengthen our school programs and ensure a brighter future for these amazing students. Note: Circle View Family Members are also eligible for complimentary tickets, drink tickets, and casino table chips with their applicable sponsorship level selection. Click here to see and reserve special Circle View Family Sponsorship opportunities. You make a dramatic difference in our school, for our students, and in our community. Your extraordinary level of support at the Diamond level will directly benefit our students and make our community better. We greatly appreciate you! Your generous level of support at the Platinum level will directly benefit our students and make our community better. We greatly appreciate you! Thank you for stepping up to support our school at the Gold level! Your generous support helps make students lives better!!! Thank you for stepping up to support our school at the Silver level! We appreciate you! Every little bit helps! Thank you for your support of our students and our school!